After two full days off in Tan Tan, I’m up for more. I decide to try a new but slightly shorter route to Smara, only 330km; half piste. 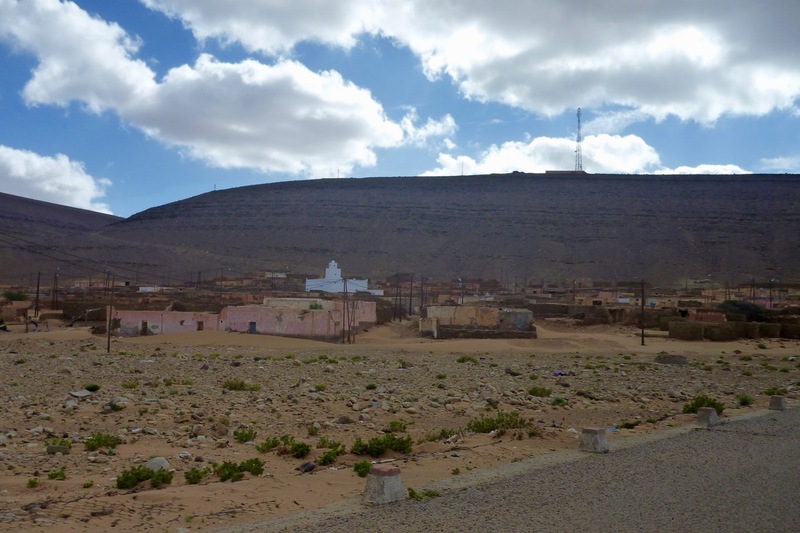 I set off for Mseid, passing the village of Tilemsen. Some of you may recall a fake news story from a few years back about a French bloke whose 2CV ‘broke down in the Sahara’. From what I recall of the version I read, it was ’staged’ just out of Tilemsen where his only choice (apart from simply walking back to town?) was to merrily pass him time cutting and welding his car into a ‘Scrapheap Challenge’ motorbike, ride out and live to tell his amazing tale. Just like James Stewart in ‘The Flight of the Phoenix’ movie. 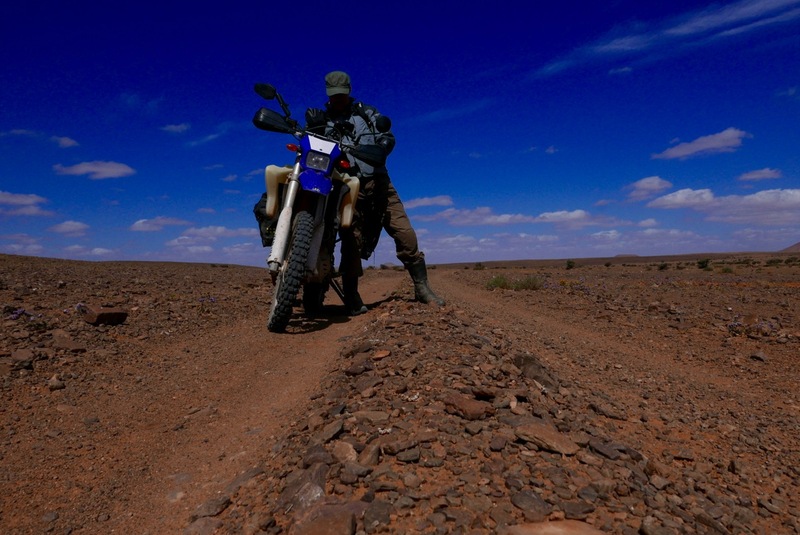 Knowingly or otherwise, all the news feeds lapped up up this epic of desert survival. The 2CV bike was real – the bloke built them for a hobby, iirc. The survival yarn, most quickly deduced, was faked. The road ends at Mseid, looking even more abandoned than usual. Someone told me later that, following recent massive rains (which broke a dam and cut the road bridge at Layounne), every nomad and his dog is out pasturing their camels and goats while the going is good. These villages are more storehouses, occupied only in summer. I head through the gap in the range and pass these wind-bent trees, like you get in west Cornwall. Good windsurfing in Western Sahara, I’m told. Without a GPS tracklog, my faint turn off to the southeast would be barely noticeable. No cairns of anything. 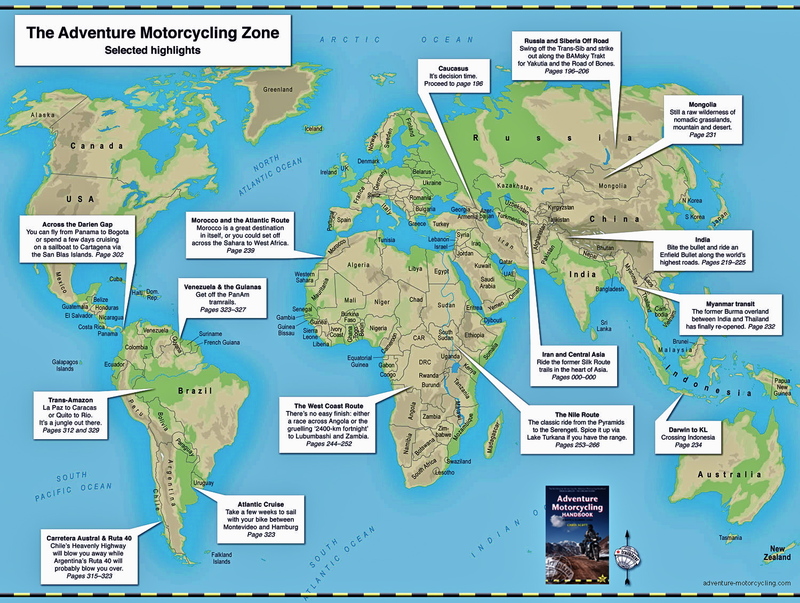 GPS means you can attempt more adventurous stuff and literally string together your own routes. 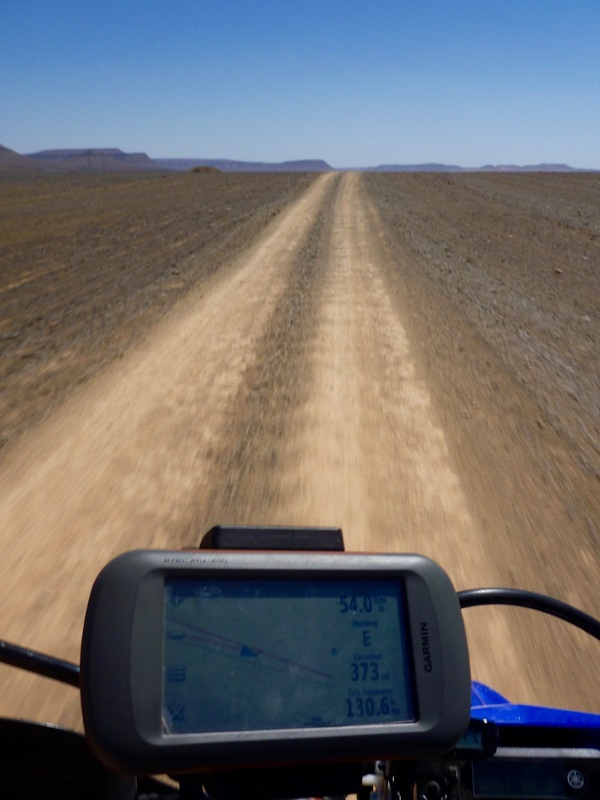 In the pre-GPS era, unless you resorted to astro-nav or hired a local guide, all we did was follow main tracks, which of course felt pretty darned adv at the time. The track is clear which is reassuring, as I don’t expect to see anyone. 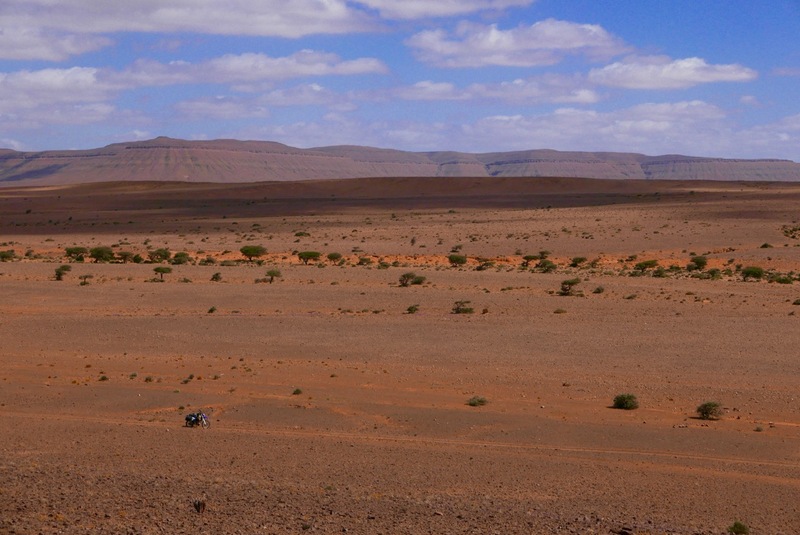 That’s the Jebel Ouarkaziz on the horizon and the Oued Draa behind it. 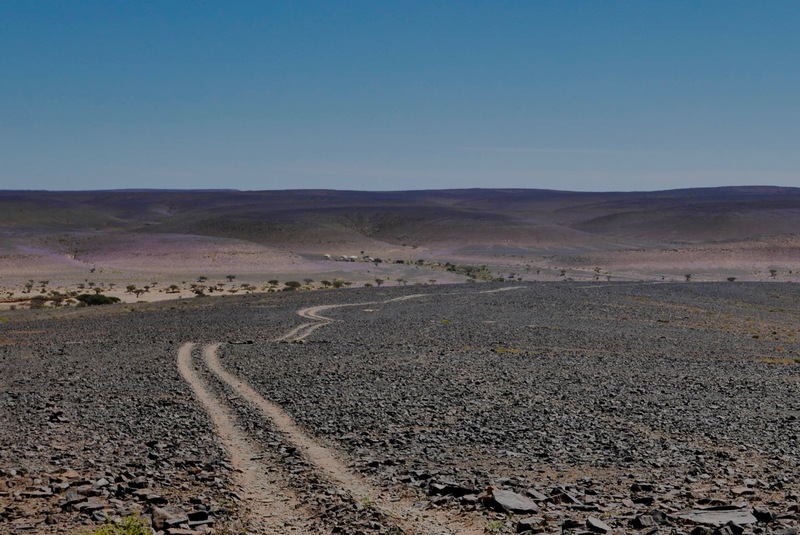 They form a natural barrier separating Western Sahara from what I call ‘mainland Morocco’. 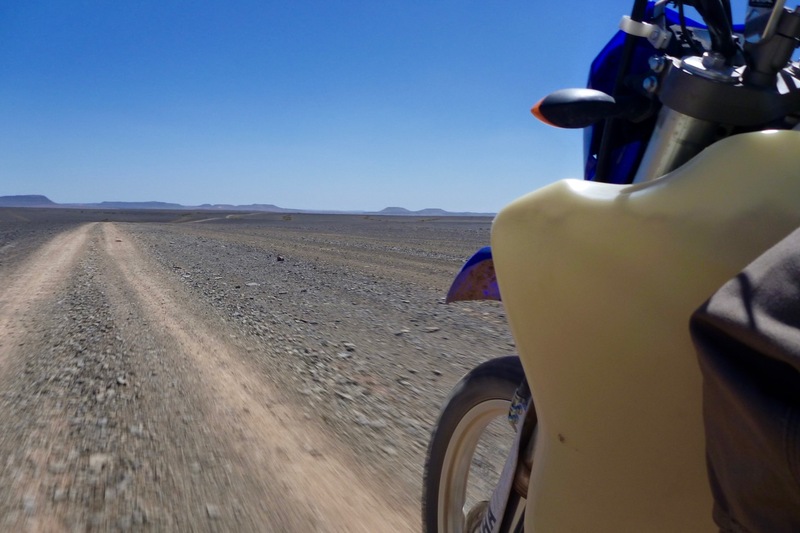 Tbh the best scenery and riding is on the mainland, but out here you get a sense of space and solitude. 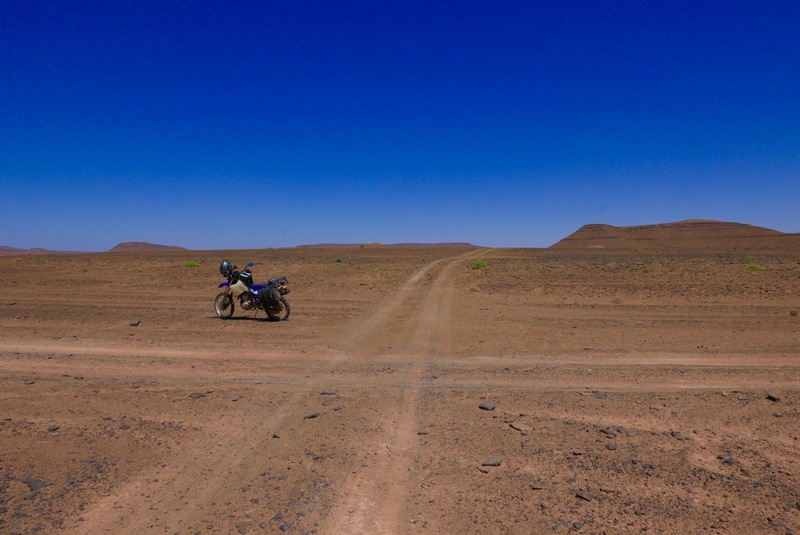 This must have been a former Dakar Rally stage as there are what I call ‘Dakar mounds’ straddling the track every kilometre or so. All helps with the nav. But as always, riding one of two foot-wide twin ruts with loose rubble a few inches to either side takes concentration. You can’t look away for more than a second. 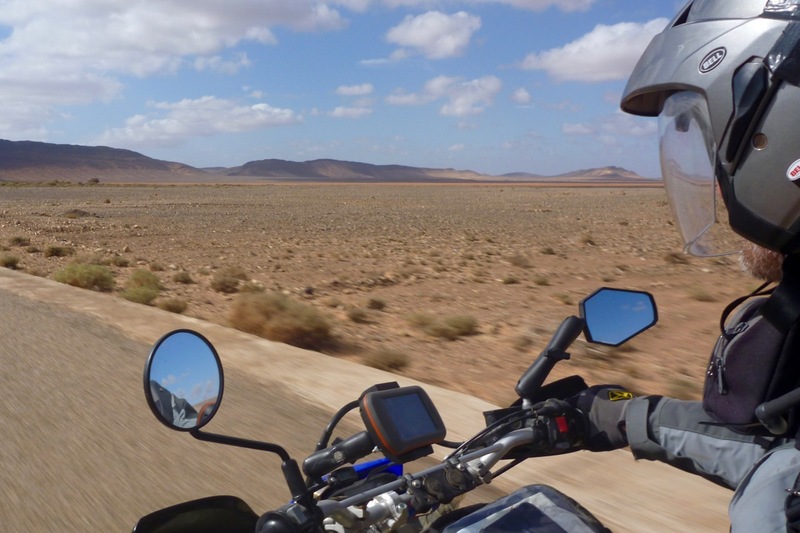 At one oued crossing I dither over which track to take. The bike wanders onto the middle hump and flips out. I brace myself to be force-fed a dirt sandwich, but luckily it corrects itself this time. WTF happened there? I think I looked left and the bike drifted with me.The deadly target fixation. It’s all over in a second but it takes just one second to blow it. And there are a lot of seconds in a day. Wildflowers are out after the rains. Bang on my 145km estimate I reach the crossroads with MW6 coming down from Labouriat where I camped a week ago. You could play noughts and crosses on that! I now turn south along MW6. It’s more washed out so probably less used, but it’s only 50km to the road. Nearly there. I get to a fork. Old Olaf GPS map points left but the right fork might be a shorter, newer route. 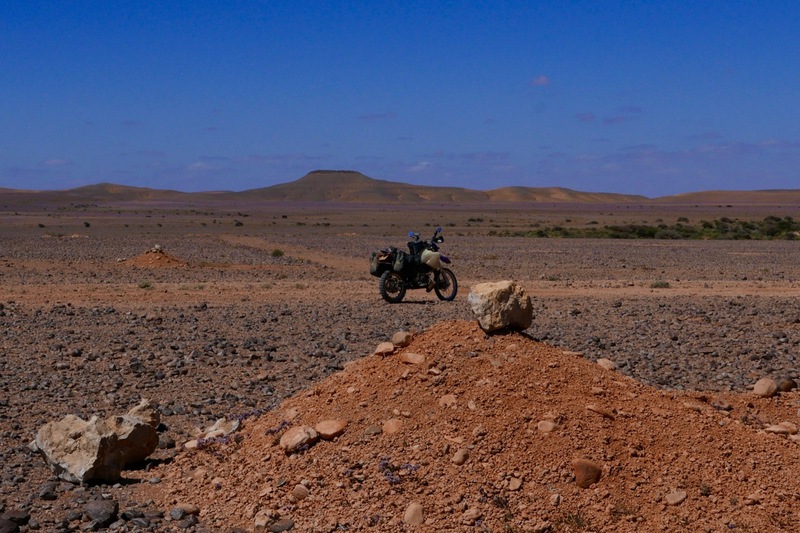 I crest a stony rise and see the big oued ahead with some nomad raimas (tents) at the back. Ah yes, I forgot bout the sandy oued. 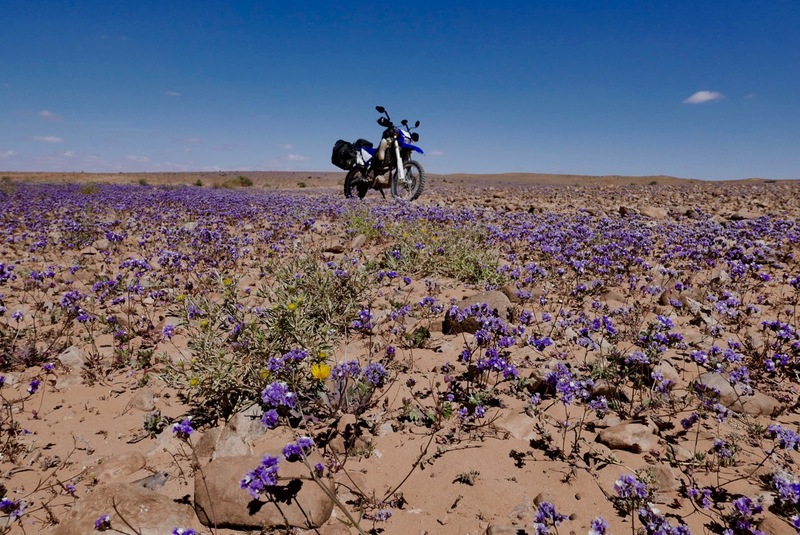 That’s the worst sort of desert terrain for a bike. 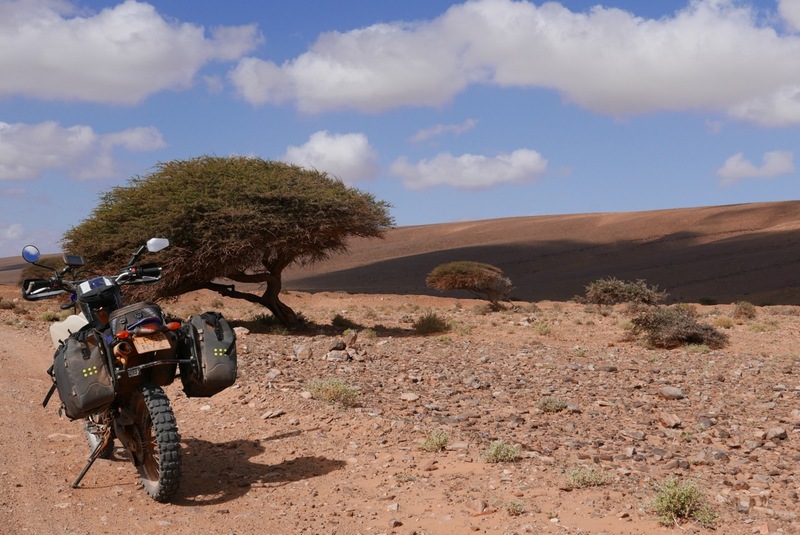 This entry was posted in Project Bikes, WR250R and tagged Morocco, mw6, western sahara, WR250R desert bike. Bookmark the permalink.